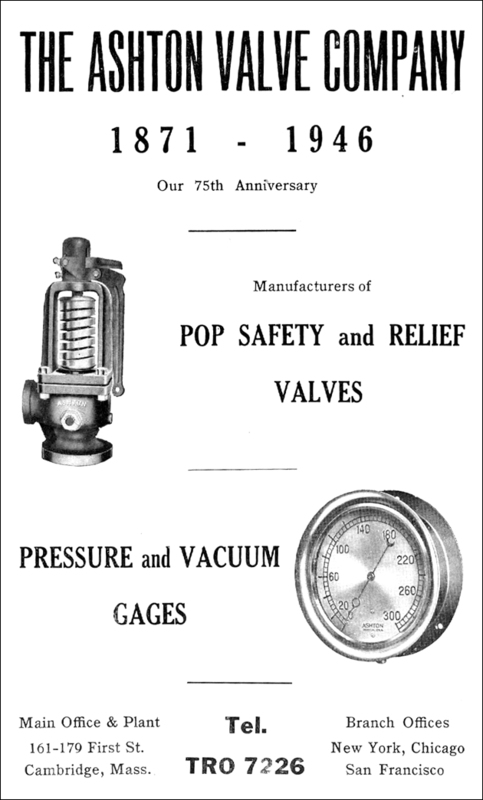 Henry G. Ashton established the Ashton Valve Company in Boston in 1871. The company primarily manufactured steam gages, safety valves, and air gages for railroads and locomotives. Ashton Valve moved to First Street in Cambridge in 1908 and rapidly expanded to fill the entire block between Rogers and Binney Streets. The firm was incorporated in 1917. By 1930, it employed over 200 people and had established branch offices in New York, Chicago, and San Francisco (Stone, 1930).